Brett Piper is back after the success of 'QUEEN CRAB' (a.k.a. 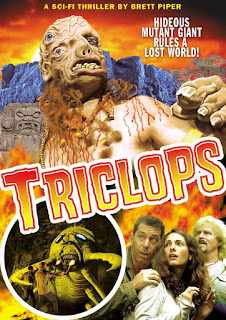 Claws) with his latest film 'TRICLOPS'. After Captain Glenn Edwards's plane crashes over a strange place known as Amarok Crater, his fiancee Samantha along with her brother in law and 2 misfits go out to the place to find him. Once at the island they go in search of Glenn but on their search they come face to face with huge creatures. Some resemble dinosaurs where others are giant insects such as an ant or a scorpion, but nothing is more threatening then the 50 foot tall Triclops that roams these lands. What has been causing these creatures to become so abnormal in size is a meteor that is leaking radiation in to the island. Discovering that the island is basically a walking death trap their search for the missing Glenn is even more desperate as the plane they arrived in has been destroyed and they must now find a way to rescue themselves. Another fun film by Piper that has lots more of his creature effects. This man is a one man stop motion animation machine and is hell bent on making sure this art isn't lost to the likes of cgi. Don't come into this expecting lots of gore and blood covering the screen as this is more of a family friendly affair much like the 1950's B-movies it is trying to emulate. Comic relief is brought to you by the likes of Ken Van Sants character Carlton Denning and Richard Lounello's character Riley. Could quite easily watch those two in a film on their own as they work together really well but that just goes to show how good Piper's writing is. Overall a film that you can watch and expect to find entertaining throughout.